This cemetery does more than honor those who have fought hard for our country’s freedom. It’s also steeped in a treasure trove of rich history. More than 400,000 active duty service members, veterans, and their families are buried in the sprawling 624-acre grounds of Arlington National Cemetery. A total of 27 to 30 funerals are held each day during the week and between six to eight services are performed on Saturdays. Check out these 14 fascinating facts you also never knew about the Pentagon. George Washington Parke Custis, the first president’s adopted grandson, originally owned Arlington estate, which is now the hallowed grounds of Arlington National Cemetery. He toyed with naming the 1,100-acre tract of land Mount Washington in honor of his beloved grandfather, but he chose Arlington, the name of the Custis family estate in Virginia. But Custis didn’t forget to honor his presidential grandfather’s legacy. Instead of naming an estate after him, he built the Arlington House to memorialize George Washington, a mansion that still stands on the present-day cemetery grounds. Before Arlington became a designated national cemetery, it was an estate owned by the Custis family. On record, the first person buried on the grounds was Mary Randolph, a cousin of Custis’ wife and author of The Virginia Housewife, a housekeeping and cookbook. Don’t miss these famous moments in history that never happened. Within six hours of Virginia seceding in 1861, the Union troops immediately took over the Arlington estate for its optimal heights deemed advantageous for war. Unlike Confederate General Robert E. Lee and his wife Mary Custis Lee who fled from their home, James Parks an estate slave remained on the grounds and helped the troops build forts. After digging many of the very first graves for soldiers on the land, he essentially fell into his role as the first caretaker. He lived in Freedman’s Village, the Arlington establishment set by the federal government to assist slaves freed by the Emancipation Proclamation. After more than 60 years of service as a caretaker, he passed away at 93 years old in 1929. He was buried with full military honors at Arlington National Cemetery, despite never serving in the military. 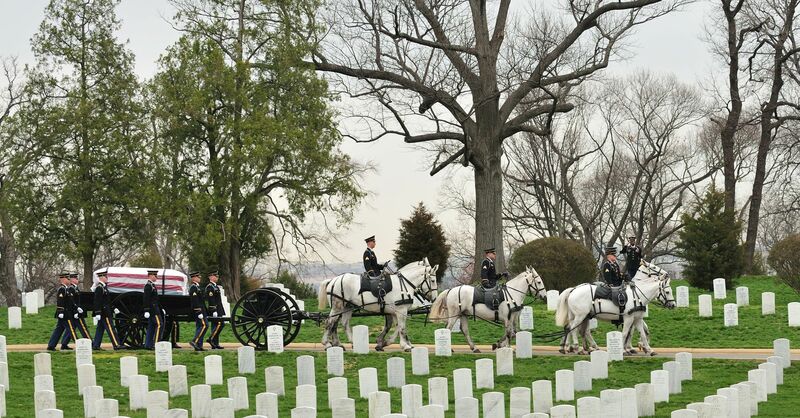 It’s been 154 years since the very first soldier was buried at Arlington. On May 13, 1864, Private William Henry Christman was laid to rest in the cemetery after less than two months serving in the 67th Pennsylvania Infantry. He died of measles. But, the War Department didn’t officially designate Arlington as a national cemetery until a month later. These are the 18 history lessons your teacher lied to you about. You can thank First Lady Helen Taft, President William Taft’s wife, and Japan for the abundance of beautiful cherry blossom trees that bloom in the cemetery each spring! A member of the National Geographic Society wrote to Mrs. Taft detailing a plan to plant Japanese cherry blossom trees around the Tidal Basin. Mrs. Taft fell in love with the idea and started making arrangements immediately. When the Japanese consul was informed of Mrs. Taft’s plan, the country offered to donate 3,000 of its coveted flowering trees. After the trees were planted, Mrs. Taft and the Japanese ambassador’s wife knelt down to plant the first two cherry blossom saplings together in 1912. Today, those trees still stand tall with a plaque commemorating the occasion and symbolizing the friendship between the Japanese and American people. Here are the 15 most fascinating facts you never learned about America. More than 8,600 native and exotic trees dot the expanse of Arlington National Cemetery with a vast array of cherry blossom trees included. In 1910, the United States received Japan’s generous donation of 2,000 cherry blossom trees to plant in the cemetery. But to everyone’s dismay, the Department of Agriculture said that the trees were disease-ridden from an infestation of insects. President Taft granted his consent to burn the trees because they needed to be destroyed. Yet again, the mayor of Tokyo and others from Japan kindly sent a new bundle of 3,000 cherry blossom trees to the U.S. Capitol in 1912. In 1930, William Howard Taft was the first president to be buried in Arlington National Cemetery. A granite monument that rises more than 14 feet tall marks his grave. But John F. Kennedy’s burial plot is a bit more elaborate. Initially, his 20 feet by 30 feet plot was surrounded by a white picket fence. But when more than 16 million people visited his grave after his assassination, the Kennedy family and cemetery officials decided to construct a more suitable gravesite for the public’s viewing. On July 20, 1967, his wife Jacqueline Kennedy, lit the Eternal Flame, which now burns from the center of a 5-foot flat stone located at the head of his grave. Both she and Mrs. Taft have also been buried next to their husbands at Arlington. Even though Arlington National Cemetery is older than the cell phone, it does have its very own app! The ANC Explorer gives you directions to grave sites, headstone photos, self-guided tours, and even saves your burial record searches! The app is available to download for iPhones and Androids. Check out these 24 U.S. State questions everyone gets wrong. One of the more notable recipients is Private Henry Johnson located in Section 25. He was awarded the Medal of Honor in June 2015 for his bravery in World War I. In May 1918, a dozen German men attacked him and took a fellow service member captive during a raiding party. Despite Johnson’s wounds, he pursued the enemy and used nothing but a knife to save him and his combat buddy. His daring actions earned him the nickname “Black Death.” Learn about these 10 simple but powerful ways you can support vets even after Memorial Day! Seven days a week, 24 hours a day, 365 days a year, the Tomb Guard sentinels keep a watchful eye on the Tomb of the Unknown Soldier rain or shine. Sentinels are typically volunteers from the 3rd U.S. Infantry Regiment, the oldest active-duty infantry unit in the Army commonly known as the Old Guard. Only the best of this elite regiment are eligible to apply for the coveted position. The Tomb Guard does everything to the count of 21. They march 21 steps and turn their bodies towards the east or the west for 21 seconds each around the Tomb. This peculiar pull to the number 21 may seem odd to an outsider but the number itself holds major significance in the military world. The disciplined 21-count symbolizes the 21-gun salute – the highest military honor that can be bestowed upon any service member. An Old Guard member must first meet these rigid requirements to be eligible for training: superb physical condition, immaculate military record, and certain height restrictions. Next, he or she must memorize seven pages of cemetery history verbatim, learn the guard-change ceremony and grave locations, amongst countless other guard protocols and procedures. Once training is complete, the soldier must score a 95 percent or higher on a test to get their temporary Tomb Guard badge. But they don’t earn their permanent badge until they’ve completed nine months of honorable service for the Tomb of the Unknown Soldier. Even if Arlington National Cemetery wasn’t designated until 1864, the burial grounds still hold the remains of those who fought in every war since the Revolutionary War. In 1892, cemetery officials exhumed some soldiers from other cemeteries who served during the Revolutionary War and War of 1812 and reburied them in the sacred grounds of Arlington. Make sure you know these 45 things America’s troops want to tell you.